As each year approaches its end, my long-time practice has been to conduct an informal mental review, to capture an overall sense of how it’s been. At some point in this process, I refer to my written work plan to gain a more concrete picture of what I’ve accomplished as measured against what I’d planned. Tied in with that review, I also begin mulling over plans for the new year, always aware that last year is — at least in part — the springboard for this year. As the “fresh start” becomes clearer in my mind, I write down elements as they occur to me. When it seems like I’ve covered all the bases of both my work life as a weaver and my day-to-day life as a (mostly) sentient being, it all gets organized into several categories and written down in the blank back pages of my calendar. It’s easy and accessible to refer to as the year passes, though I rarely do that. Once the exercise of writing it has taken place, the main elements cling like fruitbats in my mind, inescapable and unignorable. Last year, for the first time, I established a theme for the year — “Consolidation Year” — which turned out to be spot-on in several ways. I’ve been thinking about whether I sense a theme for 2016, and today one occurred to me. It’s a phrase I came across in a comment written on Facebook by John Graham some weeks ago; it has been reverberating within my mind ever since. The one word in that phrase that feels like a stretch is “risk”. 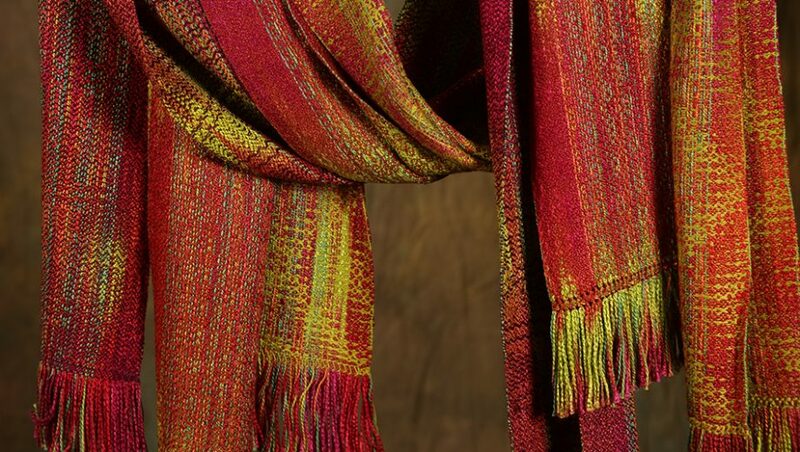 What could be construed as risk in this work as a weaver? What might represent pushing a technique or a material so far that I’m facing the possibility of falling off some edge I don’t see or expect? How can I know if — or whether — I’m nudging up against a barrier that I don’t recognize, or accept? Yet this is where I intend to place myself, and my work, at least some of the time this year. The categories in last year’s plan were ~ the work itself; health and well-being; relationships with family, friends and self; and miscellaneous matters in the house and the garden. Those will remain the organizing principles for this year as well. Each year, usually in the first week, I get together with my friend Anne Belov (painter, printmaker and cartoonist) who follows a similar process. We eat our lunch, and then take turns reading out loud our respective work and living plans. I believe we’ve been doing this for about ten years; it serves the purpose not of accountability (we’re both quite disciplined and organized) but of having one person who has a good idea of what we’re up to through the long slog to year’s end. Sometimes we check in with each other, sometimes we don’t — but it’s always an option, and there’s always a sense of support in simply knowing. I’ve already begun on this year’s weaving. There’s a glorious scarf series in process on the new Baby Wolf loom, and I’m setting up the big computer-assisted production loom with another designer towel warp. Those two series will take most of this month to complete, and I’ve mapped out perhaps the first several months worth of this year’s weaving. My annual principle of “begin as you mean to go on” is actively in place already; the year has begun in just the way I intend. COOL picture of the weaver! Stunning colorful photos to feast my eyes on this morning. Thank you! If these are all pictures of the work you have done in 2015, I am saying WOW girlfriend! Well done…..
Actually, it’s the second picture that I find so stunning. Oh my! Thank you for these beautiful, beautiful pictures, especially the first one. And for these strong words. I am inspired.